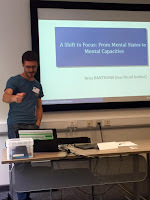 The British Society for the Philosophy of Science Annual Conference took place on 2-3 July 2015 at the University of Manchester. Throughout two days philosophers of science presented their recent work in this fascinating field, including well-established researchers as well as some postgraduate students. 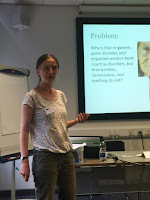 In this post I summarise five out of a broad spectrum of papers presented during the Open Sessions, related to – broadly understood – philosophy of psychology and psychiatry. 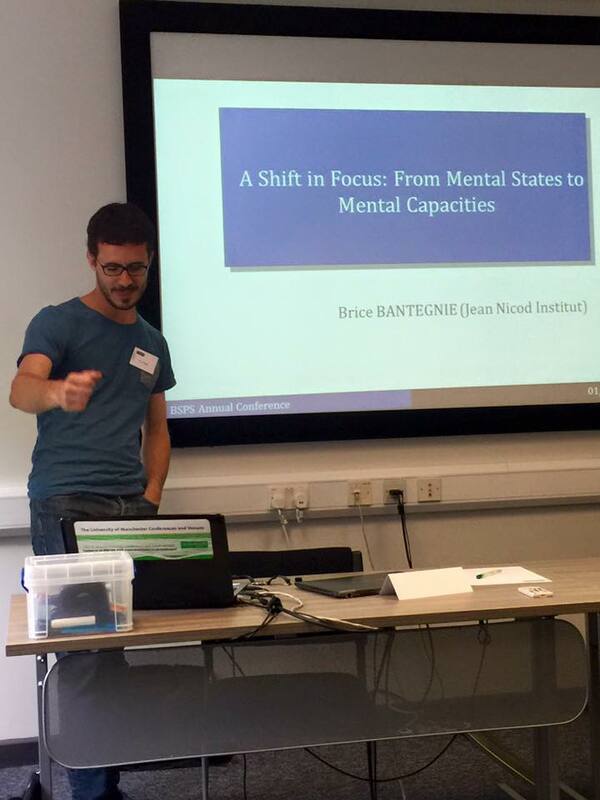 Brice Bantegnie (pictured below) kicked off the Open Sessions with his paper ‘A Shift in Focus: From Mental States to Mental Capacities’. The author reviewed different mental capacities investigated in cognitive psychology and argued that a greater attention ought to be paid to the work of psychologists in order to better understand a great diversity of these capacities. Bantegnie stressed that the good criterion of individuation can lead us to postulate a very high number of sensory modalities. 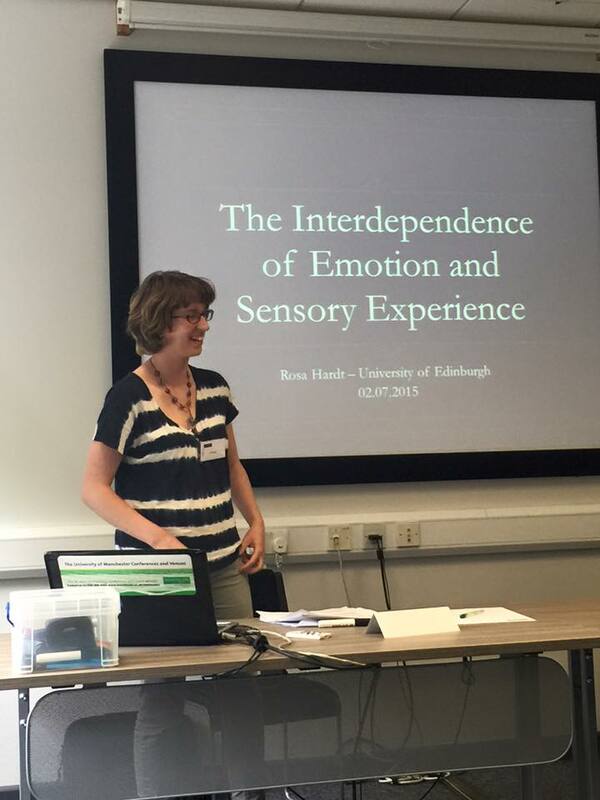 The next paper, ‘The Interdependence of Emotion and Sensory Experience’, was presented by Rosa Hardt (pictured below). Whilst endorsing the claim that emotions are felt states of the body that express how we find ourselves in the world, Hardt argued against separation of emotional and sensory experience. Such a distinction does not accurately reflects our phenomenology nor finds support in neuroscience or clinical psychology, she claimed. In the talk ‘Autism, Aspect-Perception, and Deficit Explanations of Human Differences’ Janette Dinishak argued against an understanding of autism as a condition based on deficits. Deficit-based approaches to mental phenomena have historically proven dangerous and problematic in a variety of cases. Theorists of autism, argued Dinishak, should broaden out to the notion of aspect-perception, which makes room for conceptualising autists as having points of view on the world that are not simply a matter of missing things, but provides rich descriptive tools to better understand autistic experience. 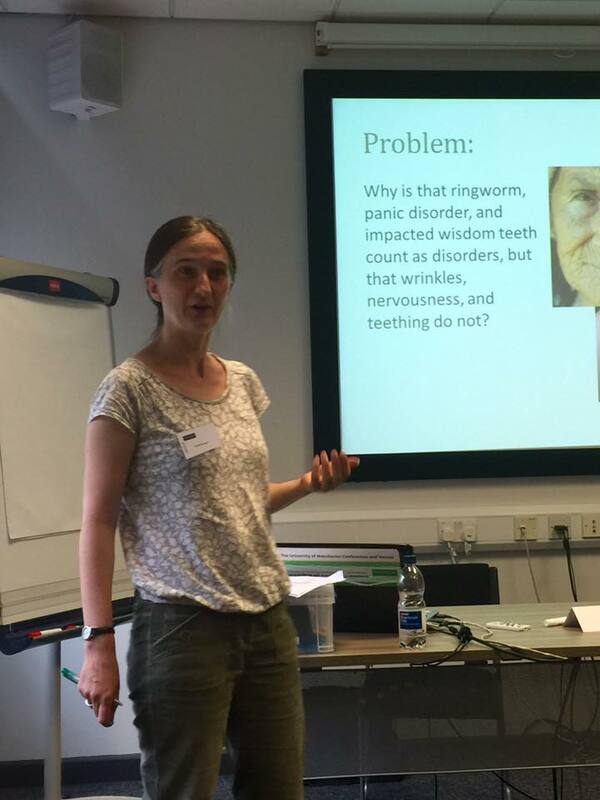 In her paper entitled ‘The Unluckiness of the Disordered’ Rachel Cooper (pictured below) asked why some conditions are considered as disorders, whilst others are not. She pointed out the problems with statistical approaches to conceptualising disorders, which face significant difficulties when dealing with pandemics. By developing a modal approach Cooper argues that the focus should be put on worlds in which there are humans designed like us and ask whether someone is badly off comparing to them. To deal with the problems caused by genetic essentialism (especially in the face of genetic disorders) a counterpart approach should be adopted in judging whether someone might have been better off. 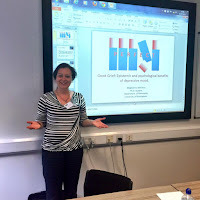 Next, I, Magdalena Antrobus (pictured below), represented project PERFECT with my paper ‘Good Grief: Epistemic and Psychological Benefits of Depressive Mood’ in which I argued that low mood, as a symptom of mild depression, may carry certain epistemic and psychological benefits for the subject. By making a contribution to the acquisition of more accurate self-related beliefs (Depressive Realism) depressive mood may be seen as epistemically beneficial. Furthermore I argued that ‘feeling low’ also has the potential for psychological benefits: empirical evidence as well as real life observations show that accurate judgments of one’s own capabilities increase the efficiency of a self-defensive psychological strategy in a situation of experiencing anxiety (Defensive Pessimism). Re-considering the phenomenon of depressive mood in terms of its potential benefits leads to a more balanced view of the role of depressive symptoms in a person’s cognitive and emotional life. 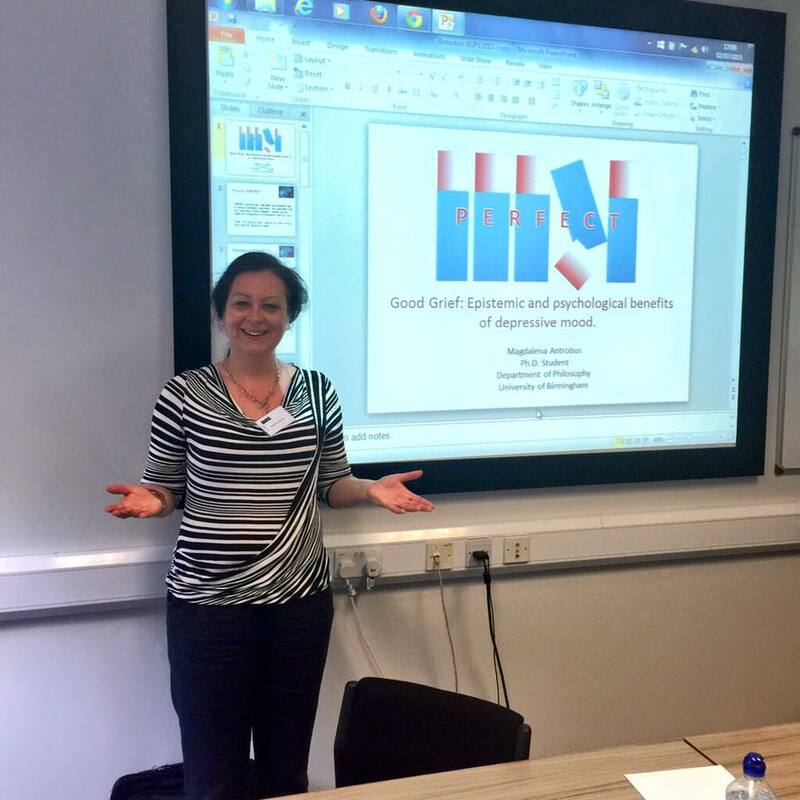 The BSPS 2015 Annual Conference was very good. It offered a rich platform of discussion on contemporary issues in the philosophy of science both during academic sessions and throughout a variety of social encounters. I am delighted that I was able to attend.